Read the latest political news out of Ecuador including new and ongoing issues, the political system, and the president of Ecuador Rafael Correa. Nearly 10,000 public officials were fired by Ecuadorean government right after President Lenin Moreno signed an IMF deal. From Feb. 27 to Mar. 1, nearly 10 thousand government employees were fired according to local media reports. This came after the Ecuadorean President Lenin Moreno signed a deal of US$4.2 billion with the International Monetary Fund (IMF) on Feb. 20. 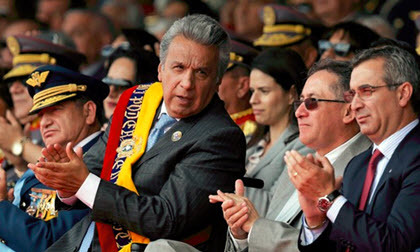 The President of the Republic Lenin Moreno denied having accounts or offshore companies on his behalf, relatives, friends or acquaintances and denied the purchase of an apartment in Europe, in his message to the nation on the night of Tuesday, February 26, 2019, after the rumors that circulated in social networks in recent days. The Bureau for Truth and Justice, formed to collect cases of political persecution of the regime of former President Rafael Correa, concluded that the former president and officials of that government used justice to persecute opponents and criminalize social protest. Last week, nearing the completion of his second year as Ecuador’s president, Lenín Moreno used the announcement of a $4.2 billion IMF deal (in addition to a $6 billion package from multilateral lenders, including the World Bank) to proudly emphasize what he considered the greatest achievement of his presidency to date: “Thanks to the firm decisions I have made, we are not what Venezuela is today … We have recovered democracy,” Moreno said in a televised address. The International Monetary Fund and the government of Ecuador have launched formal talks about a potential financial bailout for the South American country, which needs funds to cover a budget deficit and pay debt holders. “We have come to present documents that justify our complaint for the biggest robbery against the economy of the country.” With those words, Julio César Trujillo, head of the transitory Citizen Participation Council, was presented today, February 11, 2019, in the Office of the Prosecutor. The President of the Republic, Lenin Moreno, created the Anti-Corruption Secretariat and appointed Iván Granda Molina, former Secretary of Political Action, as its holder. The provision was made effective by executive decree 665, which also established the powers of the entity. The former legal secretary of the Presidency would have received $ 4.8 million for bribes from Odebrecht. The intermediary would be Carlos Pareja Cordero. The Prosecutor’s Office clarified on Monday, February 4, that he will not release Alexis Mera from investigations into the case of Odebrecht bribes. Ecuador’s private sector banks are bracing for what could become a prolonged period of slow loan growth due to the country’s severe economic and fiscal problems. As a result, its economy is set to be among the worst performers in Latin America and the Caribbean during 2019-20, as President Lenín Moreno struggles to change the nation’s state-led economic model to one driven by the private sector.